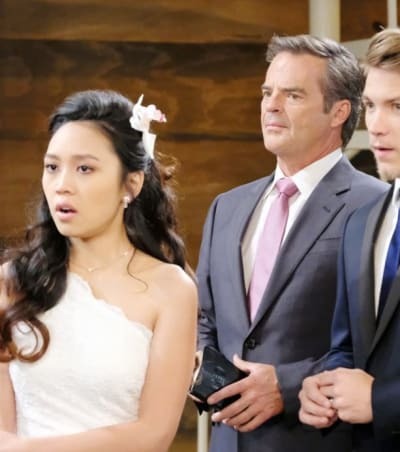 I was thrilled when Days of our Lives was announcing that Jack was returning, and the idea of JJ finally getting a love interest (and a storyline!) excited me too. To make it even sweeter, DAYS appeared to be returning to its roots with a topical story about immigration issues. Those three pieces of good news were a recipe for returning DAYS to must-see status. 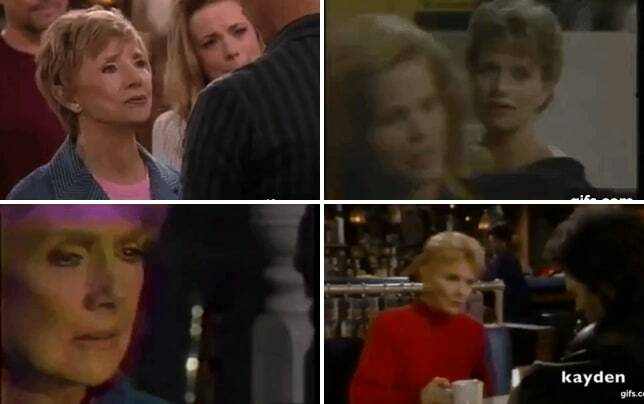 But the writers have got a lot wrong, and on Days of Our Lives during the week of 4-8-19, the story spiraled into such silly territory that it defeated its own purpose. To be clear, it wasn't ALL bad. Matthew Ashford, Melissa Reeves, and Casey Moss are all bringing their A-game to what they've gotten here, and these talented actors are a joy to watch no matter what they're doing. JJ made one last effort to get through to the man who was once his father, only to leave heartbroken and angry that Jack was now too selfish and stubborn to be who he needed him to be. And Jennifer led Jack -- and the viewers -- down memory lane to inspire Jack's memories to come to the surface. Those scenes, complete with flashbacks from years ago, were a beautiful tribute to this once-upon-a-time super couple that brought tears to my eyes more than once. Jack seemed almost like his old self for a minute during those scenes. He was witty and charming, displaying an easy-going smile and offering self-deprecating jokes that hid his inner pain and sense of low self-esteem. And his impassioned explanation of how he felt like nothing because he had no memories and no past was heartbreaking. It also did a lot to explain why he keeps hitching his star to Eve even though it's destroying his relationship with most of Salem. Unfortunately, this time Jennifer wasn't able to rescue Jack from the grip of self-hatred that so often tears him away from her, and he chose to go ahead with his wedding to Eve anyway. That might have been tragic if the rest of this story was written better. Jack's wedding to Eve took place in the Square, using the balloons and campaign signs as an altar, and most of the guests were wearing I'M WITH JACK gear, which was ridiculous, as was him and Eve using this as an opportunity to persuade people watching to vote for him instead of Abe. The only thing missing was a Facebook Live video of the event. Talk about tacky! Jack: I'm glad you're giving me a choice after taking me hostage and locking me in here. Jen: Desperate times, Jack. You know, I could stand here all day and tell you stories about what we meant to each other, but I can't make you love me. That has to come from you. Jack: Clearly what we once had was very special. But that was in the past. I don't feel that connection now. I'm sorry. I truly am. Jack acting like a circus ringmaster at his wedding was typical Jack, I guess, but something about it felt way off. I would find this story more enjoyable if Jack weren't so damn immune to anything Jennifer says! He has amnesia and feels Eve is the only one who accepts him as the Man Without a Past. I get that. But for several months now, Jack softens towards Jen or disapproves of Eve's behavior for 30 seconds at a time, only to bounce right back into brainwashed mode the second he sees Eve. There's no progression in this story. None. It's just the same thing over and over. We're always getting teased with the possibility that Jack is moving towards Jennifer, only for it to be a fake-out. I do not doubt that the latest cliffhanger is more of the same, though I'd love to be wrong about that. Jack's claim that he can't do this appeared to be because Jennifer was standing there, but I'm expecting that come Monday, it'll turn out he realized that Adrienne was trying to sabotage the wedding somehow and demand a different officiant. I don't know much more of this I can take. Amnesia interfering with a devoted couple's commitment to each other is a soap staple. That's not the problem with this story. The problem is Jack. JJ once told him that amnesia isn't an excuse for the way Jack is destroying Haley's life, and JJ is right about that. Amnesia or not, where is Jack's moral code or his ability to think critically? It just doesn't make sense that Jack's intelligence is intact but his ability to see through Eve isn't. I guess he can be given somewhat of a pass for his deep feeling that he is nobody and he needs Eve to give him a sense of purpose and identity, but the way he hangs on her every word is ridiculous. Plus, it seems he is a victim of agenda-driven writing more than anything else. I applaud DAYS for taking on a social issue story, but the way it's being written defeats the purpose. One of the current writing team's weaknesses is this tendency to put the entire town minus one person on the same side of any given issue. That was a problem with the Theo shooting story, where everyone except Abe supported JJ full stop. It's also a problem with Ben/Ciara, as 99% of the town agrees that Ben is no good. And it's a problem here as well. Everyone unconditionally supports Haley, except for evil Eve and her brainwashed sidekick. Oh, and a cartoonish ICE agent. In real life, you seldom get this level of agreement in families, never mind in whole towns! People are more nuanced than that, and it would create stronger, more believable drama if the citizens of Salem had a variety of opinions. For example, instead of everyone agreeing that Tripp is a hero because he's sacrificing his relationship with Claire to marry Haley and keep her in the country, people could have mixed feelings. The best way to fight a lie isn't the truth, is it? It's another lie. Permalink: The best way to fight a lie isn't the truth, is it? It's another lie. Kayla could want to support her stepson, yet feel he's making a huge mistake and that there are better ways to protect Haley or Jennifer could be angry that Steve's son is hurting JJ with this stunt and take her anger at Jack out on Tripp. Similarly, if DAYS wanted to take a stand on the immigration issue, Salemites could hold a wider range of opinions than "Haley is a good person who shouldn't get deported" or "illegal immigrants are all stealing our jobs." Putting everyone in the former camp except for Jack, Eve, and a few obnoxious minor characters feels like the writers are shoving their opinions down our throats. I realize this isn't a serious political drama like Madam Secretary, but if DAYS is going to go for making points about a political issue, they need to cut the agenda-driven writing and tell stories that appeal to its audience rather than preaching at them. Case in point: that ridiculous ICE agent. This story was silly from the beginning but having Agent Smith show up to observe the wedding and see if she thought the participants love each other was beyond ridiculous. Only in Salem do overworked and underpaid federal agents have the time to check out greencard holders' weddings. I suspect in real life they want to check whether the marriage is legal and the people live together, not gauge how romantic the couple seems to be! Also, you have to remain married for three years, not 30 days. Back to the story: why was Agent Smith so busy questioning Haley about Tripp's favorite type of cereal that she didn't hear Claire talking loudly RIGHT OUTSIDE THE DOOR about how jealous she is and how afraid she is that Tripp will fall in love with Haley for real? JJ was right to berate Tripp and Claire about kissing while Agent Smith was inside, but how on Earth did she miss that argument? Claire was loud, and the walls can't be that thick. But no. The stupid, oblivious bureaucrat missed that totally while freaking out about the fact that the best man got there before the groom. Has she never heard of the superstition about the groom seeing the bride before the wedding begins? There were two bright spots in this mess. One was Claire and Eve. I'm glad that Eve is beginning to realize that her affection for Claire stems from her grief over losing Paige. That adds layers to this relationship and makes Claire/Eve rootable even though their behavior is not. Eve's reaction to Claire's confession about the fire reminded me of back in 2014 when Eve learned Jill had drugged JJ. Eve always gets involved with these unstable people who she thinks can help her achieve her goals, not realizing how far they are capable of going, and ends up in over her head and having to go along with some horrible plan that she didn't authorize. The other was Eric and Eve. These two had the sizzling hot chemistry that Sarah and Eric are supposed to have but don't! Their banter at the Brady Pub could easily have been the beginning of a relationship. It's too bad the writers didn't go there a long time ago. When written properly, Eve is not that different than Nicole. She's another broken woman who has a good heart but does the wrong things out of pain. So it's not a huge stretch to think Eric could be attracted to her. Dating Eric would have allowed Eve to get revenge on both Jen AND Brady for the implosion of that relationship, and Eric dating Eve would fuel Brady's insistence that Eric always steals his women. Plus Eve would be dating Jen's most recent ex! An Eve/Eric hookup would have many of the same elements of the current Eric/Sarah/Rex disaster, but be far more compelling. As for the Sarah/Eric storyline, the less said, the better. The most disappointing part of this snooze-worthy story is Marlena believing she has the right to share Eric's feelings with Sarah! Eric might not be her patient, but surely she should understand that confidentiality is just as important when your adult child shares a painful dilemma with you. I wish when Jen had interrupted that conversation, Eric had made a point of saying he couldn't believe Jack betrayed JJ's confidence. Maybe that would have got the point across to Marlena. Anyway, Rex as a doctor who has to give bad news is a much better utilization of the character than as the insecure fiance of an overgrown toddler. I wish Sarah hadn't tagged along when he told Will about Will's brain tumor. Sarah didn't dress appropriately for work -- that dress was more party than business -- and her sudden decision to marry Rex ASAP afterward made it seem like Will's brain tumor was a plot device to get Sarah and Rex to the altar. Will's story might be moving, except I highly doubt this brain tumor will come to anything. Chandler Massey is not, as of now, leaving DAYS, and Will was brought back because of massive fan outcry over his being killed off. So it's not likely he'll get killed off again. Besides, the show is making far too much of a deal out of Will's protection charm necklace for it NOT to be involved in what's going on with him. The best news is that Rafe and Hope might be over! Please let this not be another tease or another short-lived breakup. Hope: Where are you going? Rafe: I'm gonna find Ted and then I'm gonna kill him. Hope: Of course. It's a lot easier to run away and throw punches at Ted than stay here and fight for our marriage. 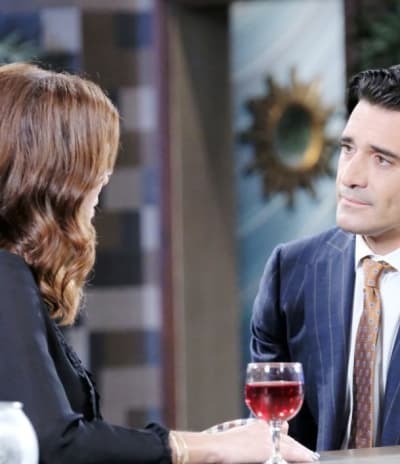 Hope and Rafe's conversation in the park demonstrated everything that is wrong with this couple. Rafe belittles Hope, denies her feelings are real and is ready to commit violence against his competition at the drop of a hat -- but doesn't want to do what it takes to make their marriage work. And Hope is insecure, needy, and prone to side-eye and snarky comments when she can't get Rafe to act the way she wants him to. Plus if she were serious about not wanting Ted to interfere in their marriage, she'd stop having long conversations with him about it. The reason for this breakup is utterly ridiculous, but I'll take it. Since all that's needed to foster a baby in Salem is to bring him home, Lani could take the baby, and the whole problem would be solved. Hope would get a good night's sleep, Rafe would know the baby wasn't going to foster care, and Jordan would be none the wiser since she's in a mental hospital and doesn't know what's going on anyway. Instead, Rafe did a lot of whining about how the baby has no one but him while Hope acted like she was being asked to take care of the baby Rafe had with his ex. Lani's attachment to this baby is not entirely healthy, but she seems to be his sole caretaker anyway, so why not let her have the official title? My guess about where this is going: Lani will move in with Rafe to help with the baby, and they will end up having an affair because she can't tell the difference between attachment to the baby and to his other caretaker. Plus Rafe is the only male cop Lani hasn't slept with yet. As for Hope and Ted, I don't see the attraction. Ted seems like a rewritten version of Aiden, and it's a shame that the writers went in this direction instead of bringing Aiden back. Aiden and Hope have a history and Aiden would be eager to redeem himself for the almost-strangling of Hope, so he might have wanted to protect Ciara from Ben. Either way, not only would there be a reason for Hope to fight feelings of attraction to Aiden, but there would also be plenty of reason for Rafe to be jealous. After all, there's been a rivalry between the two of them since before Andre got ahold of Aiden! Are you enjoying this Jack storyline or have you had enough of the Man Without a Past? Is the Haley storyline compelling or irritating? And am I the only one who's shipping Eric/Eve after their scenes during the week of 4-8-19? Weigh in below! And don't forget to check back on Sunday for the Days of Our Lives Round Table discussion. Days of our Lives continues to air on NBC on weekday afternoons. Check your local listings for air times.